The road to Rock Lake in Algonquin Provincial Park in Ontario, Canada is stunning during the Fall as the bright colored leaves adorn the forest trees. The bright colored red leaves really stand out on these trees which have taken on their Autumn appearance along the road to Rock Lake in Algonquin Provincial Park in Ontario, Canada. Once these leaves fall to the forest floor, the landscape is amazing with its display of bright colors until winter begins to creep quietly in. Fall colours along the road to Rock Lake in Algonquin Provincial Park, Ontario, Canada. 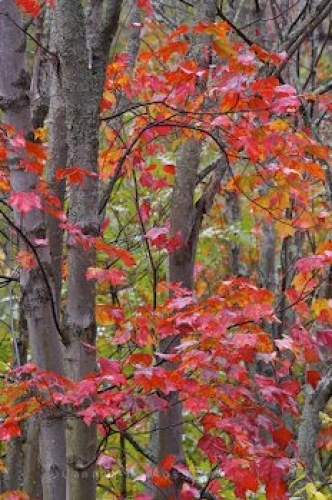 Picture of the bright colored leaves along the Rock Lake road in Ontario, Canada.